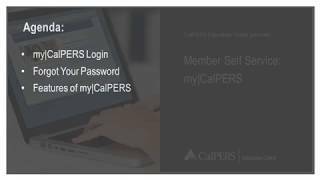 my|CalPERS is your gateway to conduct business electronically with CalPERS and access real-time details about your CalPERS account. On the Pre-Log In page, select Participant and Continue. Accept the terms and conditions under the security agreement. Identify yourself by providing your name, date of birth, last four digits of your Social Security number, or your CalPERS Identification number. Answer a set of questions about your CalPERS account to verify your identity. Create a username and password and enter your email address. Choose a personal security image and message. Choose your security questions and answers. It's important to choose questions and answers you will remember. Judges: Not all self-service features in my|CalPERS are available for members of the Judges' Retirement Systems (JRS). For assistance with your retirement questions, call JRS at (916) 795-3688. Already have an account and can’t remember your log in? Select how you want to recover your username. You can choose to answer your security questions or have a temporary passcode sent to your email address or mobile number on record. Once you enter your temporary passcode, your username will appear. Select how you want to reset your password. You can choose to reset your password by answering your security questions or by having a temporary passcode sent to your email address or mobile number on record. Once you enter the temporary passcode, you can create a new password. If you exceed the allowed number of attempts to validate your identity, your account will be locked to protect your security. To unlock your account, contact us at 888 CalPERS (or 888-225-7377). Use my|CalPERS to access health information, plan for retirement, conduct business with CalPERS online, and effortlessly enroll in educational offerings or schedule appointments. Access current and historical Health Plan Statements. Confirm current health coverage information in your Health Plan Summary. Find what health plans are available in your area. Research monthly premiums of medical plans with the Find a Medical Plan tool. Verify which dependents are covered on your current health plan. View Open Enrollment information updates. Make health plan changes during Open Enrollment. Apply for service retirement online, or save and print the information. Estimate future retirement benefits and save them to view at a later date. Register for online and instructor-led classes. Register for a CalPERS Benefits Education Event (CBEE). Schedule appointments at one of our eight Regional Offices throughout the state. Select mailing preferences for your statements and newsletters. Transmit account information to third parties, such as banks. Update federal or California state tax withholding amounts. View tax and benefit statements. Each CalPERS member is assigned a unique 10-digit identifier, which we refer to as the CalPERS Identification Number (CalPERS ID). You can use your CalPERS ID as an alternative to your Social Security number when conducting any CalPERS business. Your CalPERS ID will always remain the same, even if you retire or go to work for another employer. Log in to my|CalPERS, select the Profile tab and then select Personal Information. Refer to any correspondence from CalPERS, such as your Annual Member Statement. Use the Employer Marketing Kit to educate your employees on the features and benefits of using my|CalPERS. Send this email content with information about my|CalPERS features to your employees. CalPERS has made it easy for you to plan for retirement, manage your accounts, and conduct business safely, securely, and reliably using my|CalPERS. Do you need help planning for retirement? Use my|CalPERS to schedule a one-on-one appointment with a representative at your local CalPERS Regional Office. Want to learn more about your benefits? Log in to register for our free online and instructor-led classes. Want to change your mailing preferences? Use my|CalPERS to select whether you would like to view statements and newsletters online or receive them by U.S. mail. See what my|CalPERS can do for you. Visit the CalPERS website or log in to my|CalPERS. Select a CalPERS-approved banner ad from below. Save and place the banner ad on your web page. Do not alter the image in any way. If you use the my|CalPERS banner ad, embed a hyperlink on the banner ad image to my|CalPERS. On the hyperlink, include the alt tag "Log in to my|CalPERS." If you select one of the "my|CalPERS Are you in?" banner ads, embed a hyperlink on the banner ad image to Using my|CalPERS. On the hyperlink, include the alt tag "my|CalPERS Are you in?" If you use the image on your public website, contact us with a link to the page so we can review it. If you have questions or require additional information on our banner ad usage requirements, contact CalPERS Office of Public Affairs, Monday through Friday, 8:00 a.m. to 5:00 p.m. We're closed on state and federal holidays.